If, like me, you have children, then you’ll be well aware that any attempt to live a minimalist life quickly turns into a sick joke. And even if you haven’t experienced the consequences of procreation just yet, you’ll no doubt appreciate that to live that white-walled Wallpaper* lifestyle, void of clutter and extraneous life tripe, is a serious undertaking. I can only imagine what that peace of mind must feel like as the true minimalist gazes upon his pared-back pad of pure, clean geometry rendered in white and grey tones. It’s not to everyone’s taste of course, but the basis of minimalism – i.e. the stripping away of the useless or non-essential – is a particularly enlightened way of living. And in this day and age, who couldn’t do with a little more clarity in their lives – or wardrobes for that matter? Minimalism in modern menswear has a lot to thank Giorgio Armani for. He was arguably the first designer to popularise a stripped-back and elegantly simple aesthetic, offering straightforward suiting that defined large periods of the 1980s and 1990s. Elsewhere, brands such as Prada, Kris Van Assche, Neil Barrett, Jil Sander, Maison Margiela and Matthew Miller have all adopted the concept and run with it to great effect. And you should too. For one, it’s very difficult to get minimalism wrong, provided you follow a few basic rules. On top of that, it’s virtually trend-free, meaning it’s not likely to go out of fashion or fall out of favour any time soon. But above all, a minimalist aesthetic is extremely versatile and can be easily adapted to both formal and informal situations with hardly any effort at all. Colour can be a tricky proposition for most men. Incorporating bold blocks or flashy splashes can either work to great effect or fail miserably. The minimalist’s palette – made up notably of black, navy, grey, white, and shades of off-white – negates any potential disaster and makes mixing and matching the clothes in your wardrobe immeasurably easier, since these hues complement each other perfectly. Canadian brand Ports 1961 offers a masterclass in minimalism, from colour to cut. Beige was prominent throughout its spring/summer 2015 collection, complementing a free-flowing and loose silhouette. Waistcoats were cut asymmetrically while white sneakers came – in minimalist fashion – laceless. At Christophe Lemaire, the palette was again focused on the nuances of black, navy, white and grey, with the designer opting for a very shapeless silhouette that looked elegantly effortless. Another key aspect of minimalist menswear is that there is no standard silhouette to speak of. Unlike tailoring, which calls for a broad shoulder, nipped waist and slim leg, minimal clothing literally comes in all shapes and sizes. Why? Well, from an admittedly lofty perspective, minimalism is not only about stripping away unnecessary forms but also removing previously adhered to concepts and ideologies, leaving designers free to experiment with all sorts of silhouettes. And so we see many minimalist collections featuring boxy oversized garments, free-flowing forms, or asymmetric angles. Anything goes. 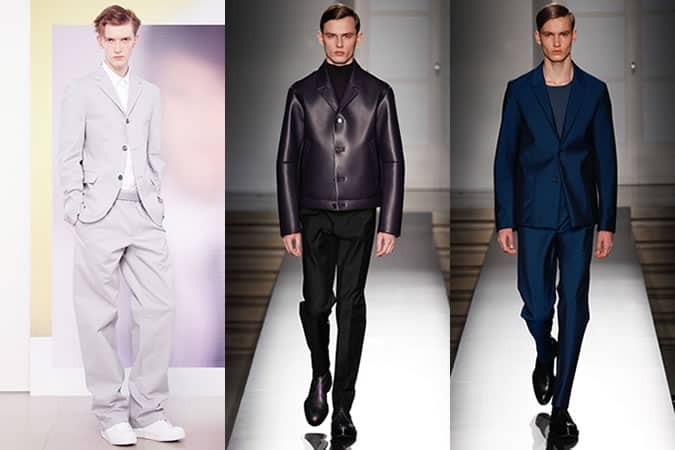 The boxy aesthetic has been increasingly popular of late, with Alexander Wang’s sports luxe aesthetic getting a lot of exposure (more on him later), but we really can’t talk about minimalist menswear without giving credit to Jil Sander who, along with Armani, has been a pioneer of the genre. Sander’s look has always been quite boxy, which was evident in the designer’s autumn/winter 2014 collection that featured square suiting in midnight blue, oversized mohair overcoats and a leather jacket that pretty much sums up Sander’s ideology. The spring/summer 2015 collection, however, moved into much more fluid territory with very loose suiting featuring baggy pants, again in the minimalist’s staple non-colour: grey. Given that there are very few concrete details to the minimalist silhouette, the focus is on form, which can take many shapes. It’s a liberating idea, and ideal if you’re bored by tailored or overly structured looks. Provided you stick to the minimalist palette, you can easily mix relaxed trousers with slim-cuts, boxy jackets/jumpers with skinny jeans, and so on. Two words: Alexander Wang. This New York-based trailblazer’s cutting-edge aesthetic was arguably responsible for the rise of sports luxe, even defining some of its hallmarks – including hidden zips, bonded seams and modernist patterns on a background of black. Hussein Chalayan, although certainly not as commercially ‘street’ as Wang, melds a modern minimalist aesthetic with vintage sportswear. Another minimalist who treads the line between functional sportswear and luxury finishes is Neil Barrett. His spring/summer 2015 collection was, as he put it in a Style.com interview, all about “taking an idea and developing it in a tight palette”. The key takeaway from all these collections is that by playing within a very tight palette you have to look more closely at form and texture. Rather than being limiting, the minimalist approach allows you to experiment with these variables, and the results speak for themselves. The minimalist movement has also lent its reductivist hand to tailoring. Think of the French placket and hidden placket, for example, both of which aim to incorporate buttons in a much cleaner way than the classic open placket. Ties too have become less ornamental, with the skinny version now a mainstay in many men’s wardrobes. There’s even a growing trend to get rid of the tie altogether and redefine the protocol of ‘smart’. At Issey Miyake, meanwhile, the double-breasted suit was pared-down even further with just two buttons, a deep scoop neck under layer and neck scarf for company. On Savile Row, an institution with few, if any, aesthetic ties with modern minimalism, Kilgour – under the stewardship of Carlo Brandelli – is bucking the trend. Brandelli’s ‘unstructured’ suits for Kilgour come void of bulky lining, lending this house’s tailoring a minimalist easiness that marks it apart from that of its esteemed neighbours. Minimalism is not so much an architectural or design concept, as a mode of thinking in itself. The basic framework is, characteristically, simple to follow: this is about ascetic clothing rather than aesthetic, which means as little fuss as possible. Start with a strictly limited colour palette, grounded in neutrals like white, black, grey and navy, but feel free to branch out into soft pastels come summertime. Secondly, experiment with textures and fabrics to add additional interest. Finally, remember there is no standard minimalist silhouette. Seeing as it’s not governed by the same strictures as tailoring, you can feel free to mix up shapes and subvert traditional ‘rules’. Have you tried your hand at minimalism? Will you be taking a more pared-back approach to your wardrobe this year? What are your key fuss-free staples?